Instead of crushes of humanity and bureaucracy, airports are starting to get more personalized and more civilized, as the fantasy of what an airport could be gets real. If you’ve ever wondered how a bottle of duty-free vodka finds its way to your departing gate (and back into your arms) at a big international airport, or how it’s possible that you can have gastronomic delights delivered to you–on demand, in coach!–on Virgin flights, then maybe you also question (aloud, I hope) a few other things concerning your airport experience. Maybe you wonder why someone can’t find you as you enter the terminal to whisk away your bags, leaving you free to move about unencumbered by bulky luggage or even your ever-present laptop. Maybe you wonder why, if there’s already a separate security lane for VIPs, unescorted minors, and prisoners, you can’t have a quicker pass through security as well. Maybe you wonder why you can’t have a meal of your choice delivered to you at the gate. It may sound ridiculous, but it’s actually sound business. Airport operators, owners, and developers all over the world are realizing that people will indeed spend time–and good money–at an airport if you give them something to be blissful about: top-notch retail and cuisine, spas and other retreats, even nine holes played out under the roar of jetliners. Airports in Europe have led the global pack in blissful consumer spending. In 2010, they reported revenues of about $7 billion on airport concessions and food/beverage sales alone, according to Airports Council International. In the Asia-Pacific region, that number was $6 billion in 2010. In North America: $1.7 billion. But along with that “something for everyone” approach to building a better airport terminal experience is a subtle, yet powerful, movement toward better details. It’s a focus on “personal touch” and the idea that it’s possible for airports to deliver a concierge-like experience to travelers–all travelers, not just VIPs and first-class denizens–as well. And airlines are starting to come onboard with this thinking too, realizing that the battle for future passengers may not be won on price, but on how happy, and special, people feel. Smartphones have probably done more to promote the personal happiness factor than anything else. They’re freedom to forget your boarding pass, insight into the next flight out, a guide to the best dining and shopping–handheld control over one’s travel destiny. They’re also a model for agility that could be applied elsewhere. For instance: Why can’t a similarly streamlined, mobile application find its way to the check-in process? Why can’t the scanning of bags–that onerous security procedure–be disassociated from the actual check-in process, so that travelers aren’t bogged down with stuff? What if luggage could be dropped off at the airport parking structure or at the airport hotel? Bags could be plastic-wrapped and sealed there to ensure security, scanned as though they were going to a bonded warehouse, and then delivered to the appropriate gate. The precedent and the technology exist. Think: skycaps. Think: mobile checkout (as seen at more and more retail stores, restaurants, and even hotels, eliminating the need for queues). JetBlue recently made an exploratory nod to such “My Airport” agility by prototype testing a concierge service with its passengers in New York. Armed with handheld devices, JetBlue employees roamed the ticketing hall, greeting travelers with the inquiry, “May I take your bags?” If passengers were game, their checked luggage disappeared into the scanning/security process right then and there, and their carry-on bags similarly vanished–but then rejoined them at the gate. Travelers proceeded unencumbered, and happy, to get their boarding passes or directly to security and into the terminal. Suffice it to say that every one of the other major U.S. carriers is actively investigating its own version of this ticketing hall of the future, and airport owners are getting in on it, too. Happiness is arms free of heavy bags, but it’s also a security process that’s less like herding cattle. The Transportation Security Administration is currently testing a “behavior detection program” at several U.S. airports. Passenger behavior determines if a traveler should be subject to additional screening; people are considered individually. Taste is also very individual. How would you feel about on-demand gastronomy at “My Airport”? Virgin America and Virgin Atlantic airlines set a precedent–and numerous exclamations of “wow”–with their in-flight, get-it-when-you-want food service. And we’re starting to see such personalized food service spread to the airport terminals as well. 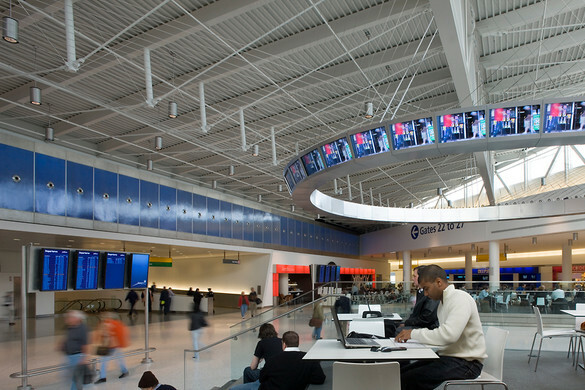 Inside Terminal 5 at JFK in New York, for instance, waiting JetBlue travelers can order food via touch screen from special seating areas at the edge of the holdroom, where concession agents then provide the delivery. “My Airport” is considerate like that. Perhaps the glory days of air travel are not a sighed-over memory but an era yet to come–and one that’s all about you. Bill Hooper is an architect and Principal at Gensler, a global design firm, whose airport design portfolio includes Incheon Airport’s forthcoming Terminal 2, San Francisco International Airport’s Terminal 2, and JFK’s Terminal 5 (JetBlue).